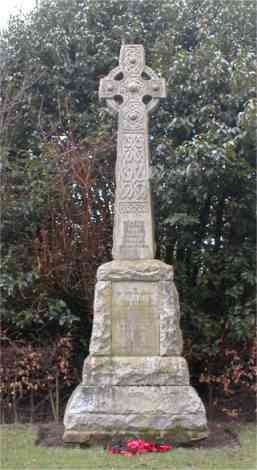 The 73rd Highlanders were raised by John MacKenzie, Lord Macleod, as the first clan Regiment in 1777 in response to the outbreak of the American War of Independence. In 1786 the Regiment was renumbered as the 71st Highlanders and wore the MacKenzie tartan kilt. In 1787 war in India necessitated the raising of more Regiments for foreign service and the 74th Highlanders were formed in that year in the City of Glasgow. At the Cardwell reforms of 1881 the 71st and the 74th were linked as the 1st and 2nd Battalions of the Highland Light Infantry (as the 71st had been known since 1809). In 1923 the Regiment officially became known as the ‘City of Glasgow Regiment’. 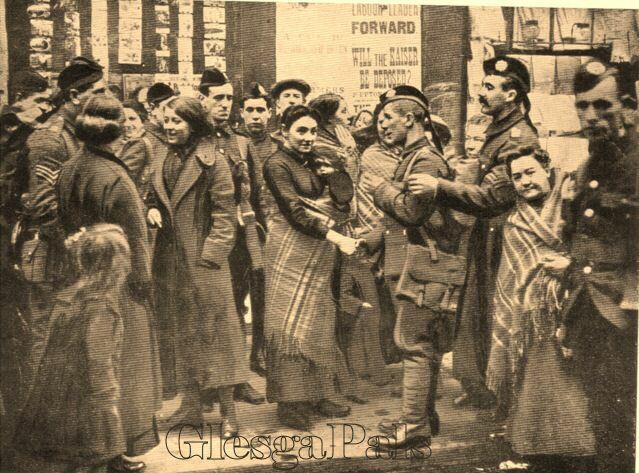 August 1914 : at Garnethill, Glasgow. Part of HLI Brigade in Lowland Division. Moved on mobilisation to Dunfermline. On the 11th of May 1915 the formation was renamed 157th Brigade, 52nd (Lowland) Division. Main Street, Bridgeton, Glasgow, c1914. recruiting at their headquarters in Bridgeton at 92 Main Street . This drill-hall was built at 92 Main Street in1902 costing £12,000. Fabulous photo capturing the excitement of the occasion, sweethearts and wives, smiling, excited. See the woman holding the baby in the tartan shawl - something the Glasgow woman did right into the 1960's. Sadly as we now know many of our brave boys never returned from GALLIPOLI - EGYPT - FRANCE - BELGIUM - MESOPOTAMIA leaving many wives and sweethearts broken hearted. Bridgeton, Main Street, circa August 1914. 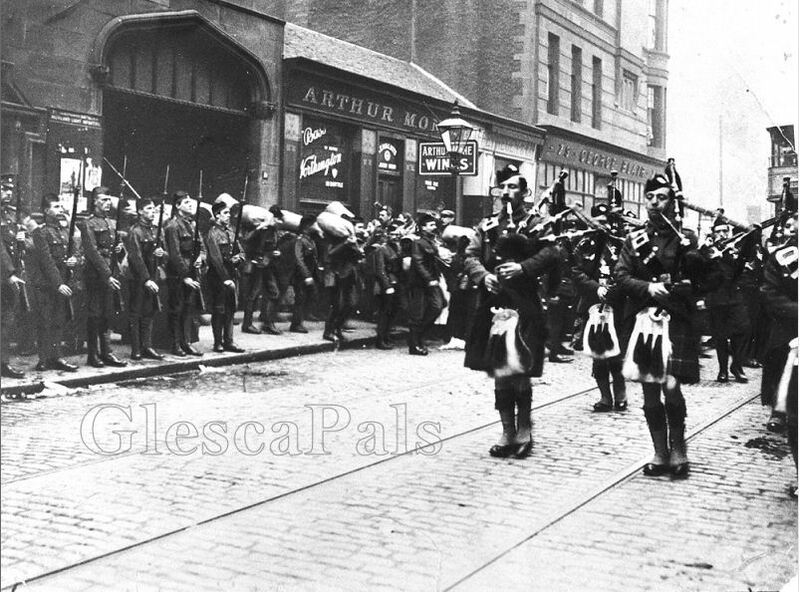 The 1/7th (Blythswood) Battalion Highland Light Infantry leaving their headquarters. The Battalion served with the 52nd (Lowland) Infantry Division at Gallipoli and in Egypt, Palestine, France and Belgium during the First World War. 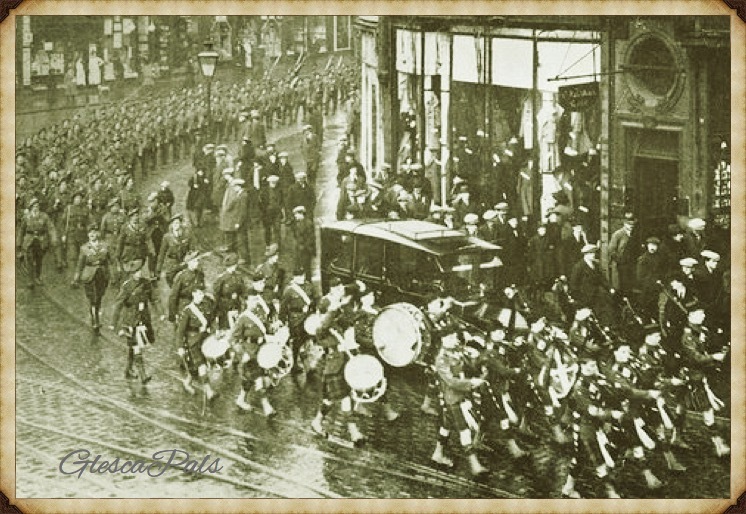 on the homecoming parade in 1919 entering into Sauchiehall Street at Charing Cross. set-off to take up arms in the Great War which began exactly 100 years ago. Over 400 men of the 7th battalion were killed in Gallipoli, France and Flanders during the Great War 1914-18. They and their fallen comrades from other wars will never be forgotten.